Did you know that 17% of the United States’ total population is Hispanic? Did you know that Spanish is the second most talked language in the United States of America? 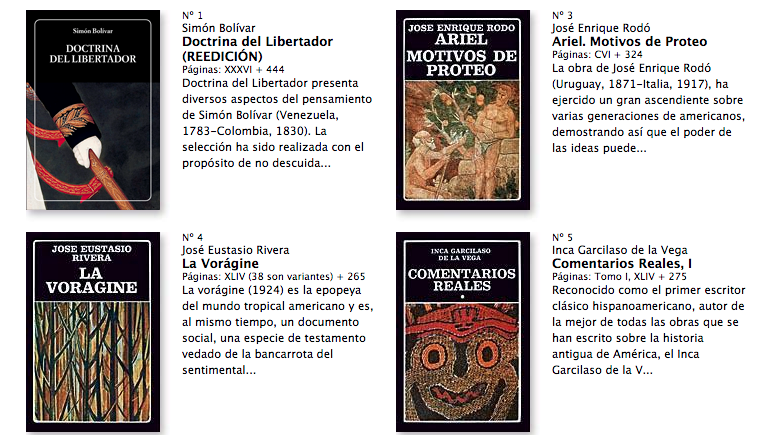 In Biblioteca Ayacucho website (one of the most important and huge publishing house of Latin American Literature) you can download entirely free classical Latin American books. The books also include a preface written by important literature critics so you can learn more about the context, the author and the content of the book. For example, you can download Facundo, from the argentinan writer Domingo Faustino Sarmiento, a foundational book about the region’s development, modernization, power and culture in Argentina. This book contrasts civilization and barbarism as seen in early 19th-century Argentina and almost all Latin American continent. Literary critic Roberto González Echevarría calls the work “the most important book written by a Latin American in any discipline or genre”. As well, you can download Ruben Dario’s poetry, one of the most important poets of Latin America, or the fiction writings from the venezuelan writer Teresa de la Parra, whose novels are very studied in important american universities. If you want to know more about important latin american books, Biblioteca Ayacucho is the place that you are looking for.